© 2014 a chapter away. We are delighted to announce the launch of our NOVEL WRITING RETREAT in July 2017. This five-day intensive course is set in a characterful manor house in beautiful and peaceful South West France. 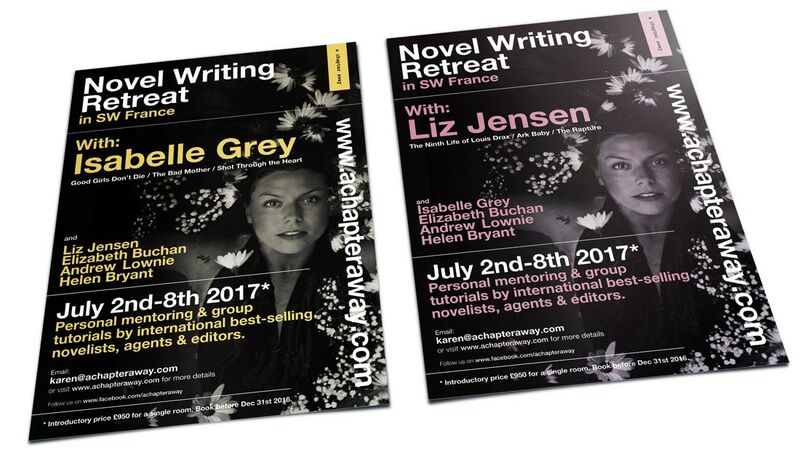 As a student you will be working closely with our two tutors and best-selling authors: Liz Jensen and Isabelle Grey. In a series of unique tutorials, you will be learning the structures and processes necessary in order to craft a novel that is both gripping and evocative. As an aspiring writer you will be looking at how to create convincing characters, while examining the devices necessary to drive plot and narrative in your work. Tutors will discuss how to develop the underlying themes and ideas that are essential to any novel. The course teaches techniques that are relevant to writers of all genres: literary fiction, crime novels, psychological suspense, speculative fiction and domestic noir. Our guest author for the week is Elizabeth Buchan who will be reading from her work and sharing her writerly tips with you. Helen Bryant from Cornerstones Literary Agency will be joining us to answer all those questions you never dared ask, discussing how to self-edit your work, and offering a hint as to which of the many literary agents she works with might be interested in your book. Andrew Lownie, the world's N° 1 best-selling literary agent, will hear extracts of the work you have written during your stay, while offering you the unique opportunity to rise from the slush pile and pitch your book to him. Details of other guest speakers will be posted on our website in the coming months. We look forward to meeting you and helping you become a published author. Est. MMXVI © a chapter away.